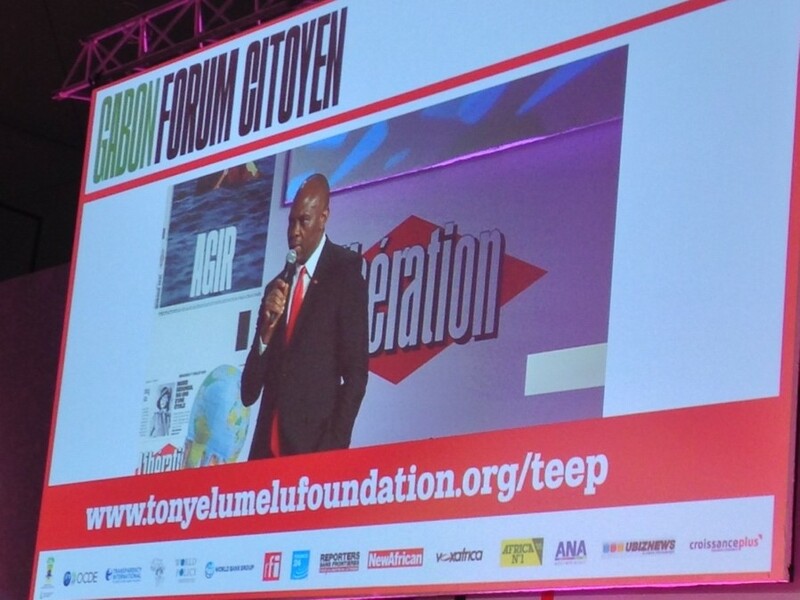 Last week, I was fortunate to accompany TOE – the founder of the Tony Elumelu Foundation and Chairman of Heirs Holdings Group – on a recent trip to Gabon and then onto Lima, Peru for a variety of appearances. 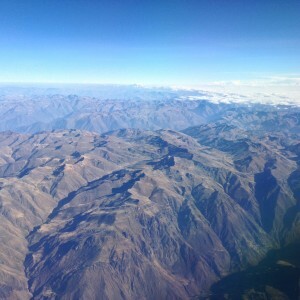 This is my behind-the-scenes look at our trip. We departed from Lagos early in the morning in order to reach Libreville, the capital of Gabon, in time for TOE, our founder, to speak at an event organized by entrepreneurs in Gabon. 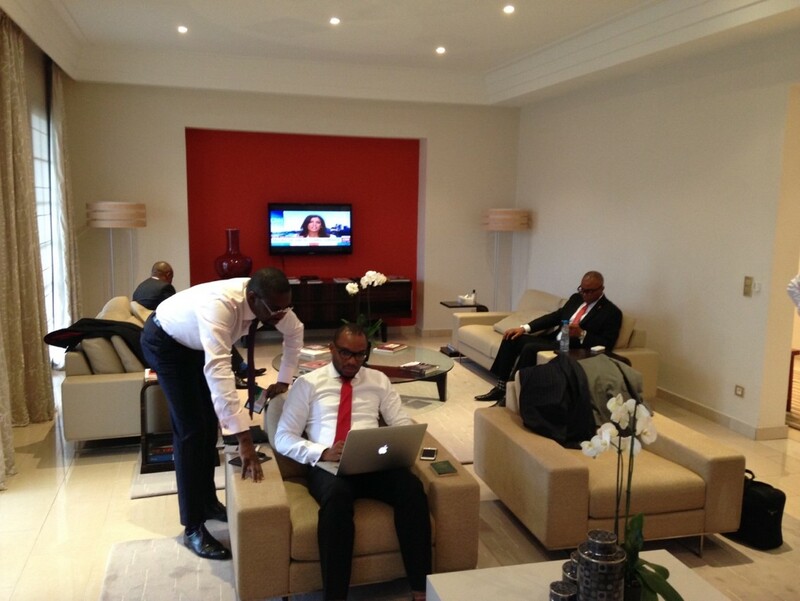 Sitting across from me on our flight was Wale Shonibare, ‎Deputy Group CEO/MD, Investment Banking at United Capital Plc. 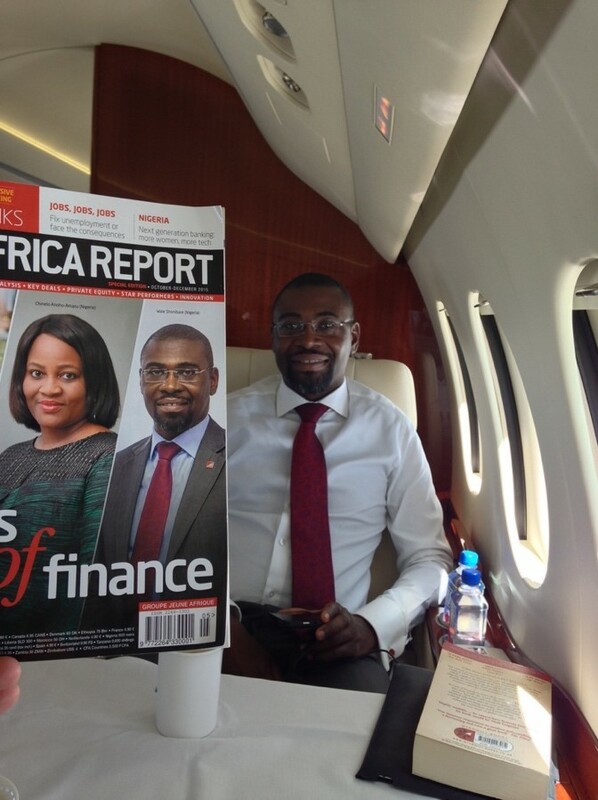 He’s also a celebrity as he is gracing the cover of this month’s “Africa Report”. 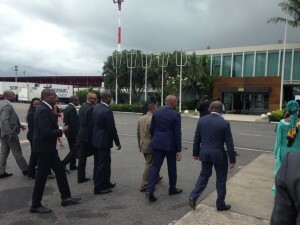 TOE and senior executives from the United Bank for Africa along for the trip are warmly welcomed at the airport by Nigeria’s Ambassador to Gabon. 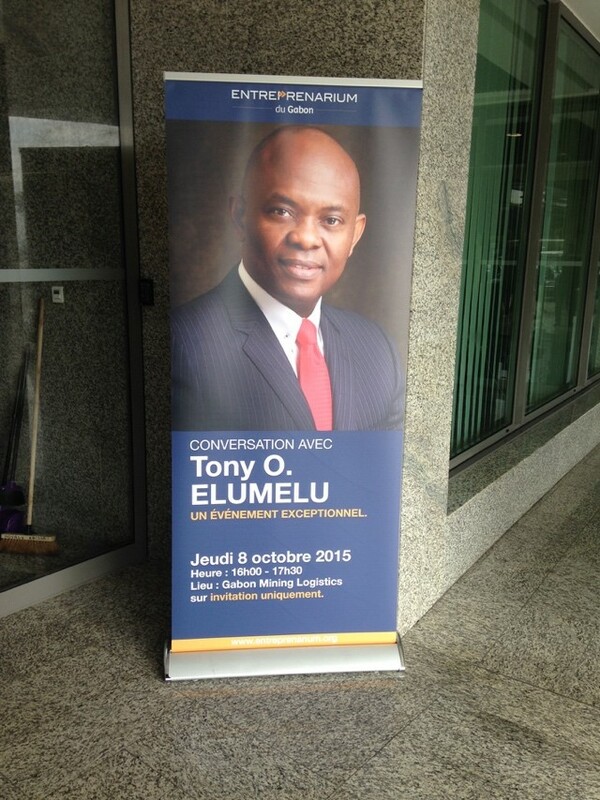 TOE is the featured speaker at a Forum on entrepreneurship in downtown Libreville. 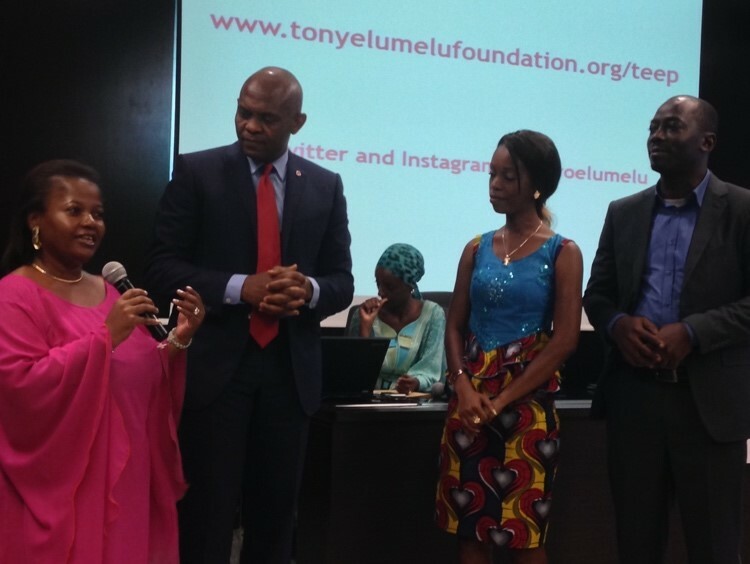 Two of the Gabonese entrepreneurs selected for the Tony Elumelu Entrepreneurship Programme in 2015, and one of the programme mentors, share the nature of their business and aspirations in front of a packed auditorium. 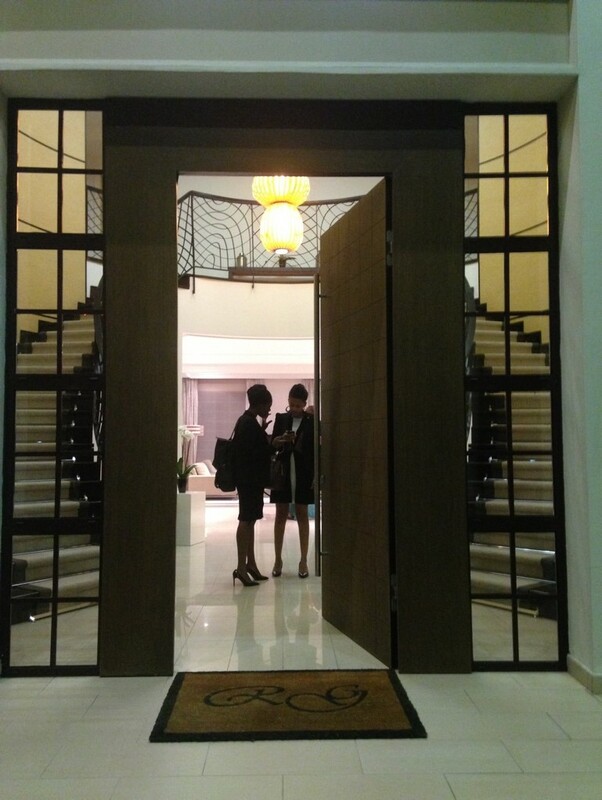 His Excellency Ali Bongo Ondimba, President of Gabon, kindly offered to accommodate the Chairman at the Presidential Guest Villa, which is normally reserved for Heads of State. The Chairman’s team utilizes a few minutes of down-time to catch up on emails and other duties. Mr. Elumelu was invited by the Liberation newspaper from France to provide the keynote address at their inaugural Forum in Gabon. The theme of his speech is Africapitalism. 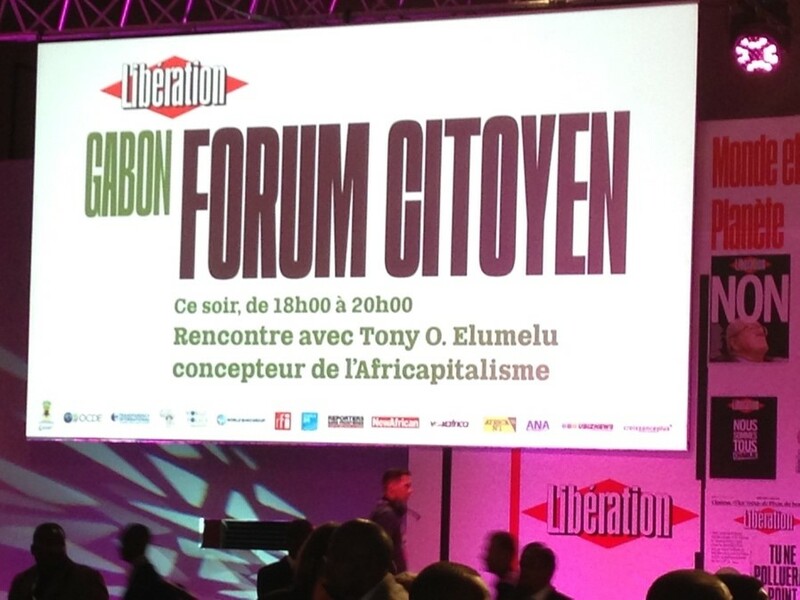 During his speech, Chairman discusses the tenets of Africapitalism as a tool to catalyze private sector-led development across the continent as well as the importance of empowering entrepreneurs to create bottom-up solutions to Africa’s challenges. 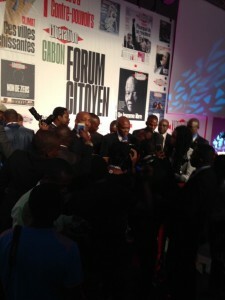 The moment his speech has concluded, the Chairman was mobbed by attendees asking follow-up questions, taking selfies, and expressing their thanks. 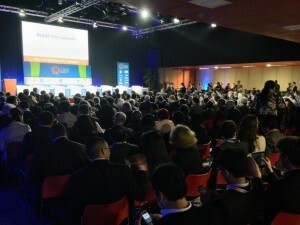 Chairman was invited to speak during the annual meetings of the World Bank and IMF at the convention center in the center of Lima, the capital of Peru. Mr. Elumelu joins a very distinguished panel as the only representative of the private sector in an important discussion about how the Sustainable Development Goals will be accomplished. 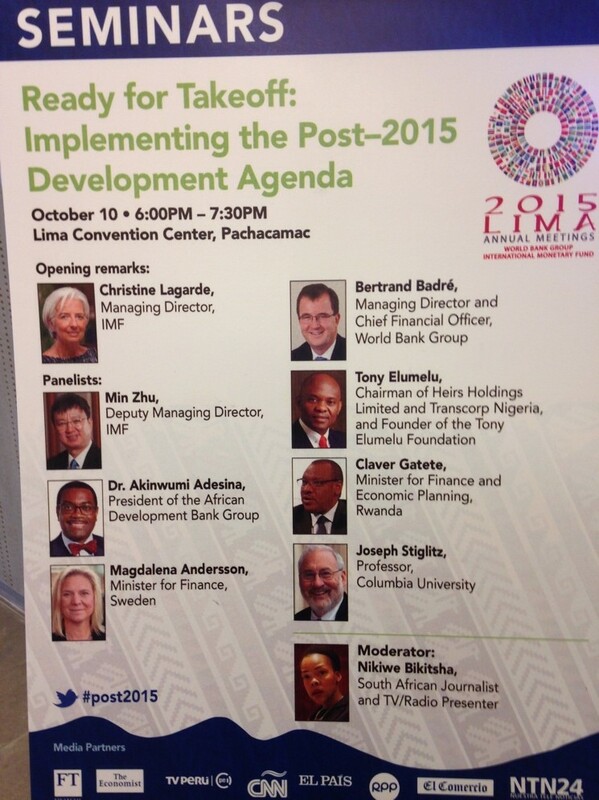 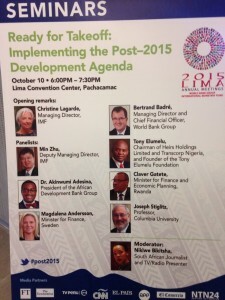 The panel was introduced by the Managing Director of the IMF, Christine Lagarde. 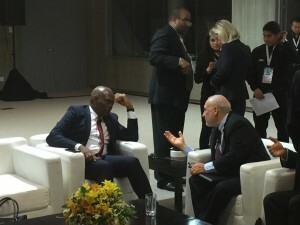 Just prior to the beginning of the Chairman’s panel, he and and fellow panelist, Nobel Prize-winning economist Professor Joseph Stiglitz, confer in the Green Room. 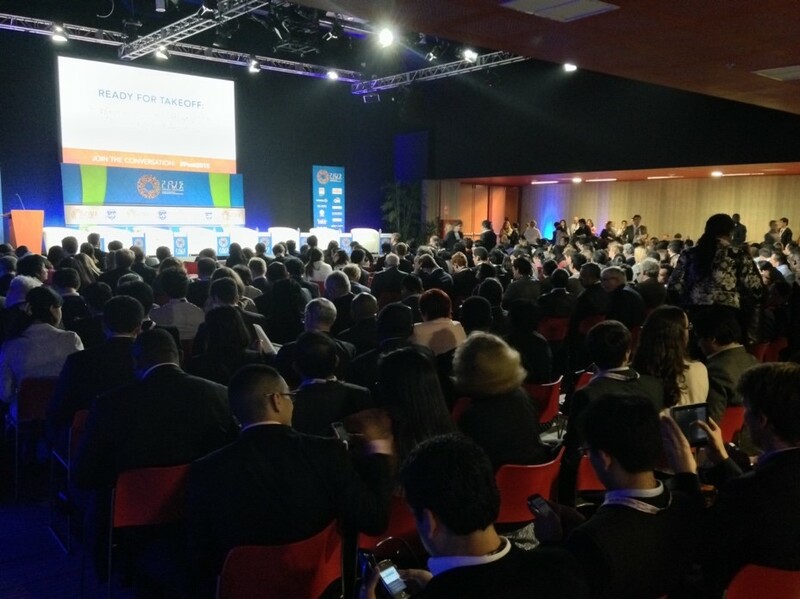 A standing room-only crowd waits for the panelists to take the stage and begin the session. 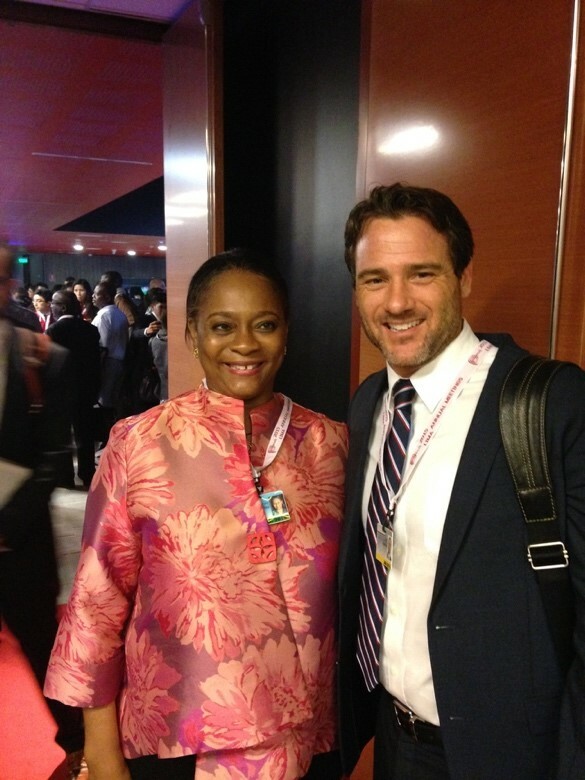 Immediately following the panel, I ran into Arunma Oteh, Vice President and Treasurer of the World Bank, who was in the audience listening to the discussion. 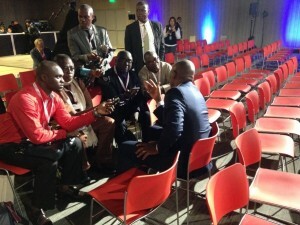 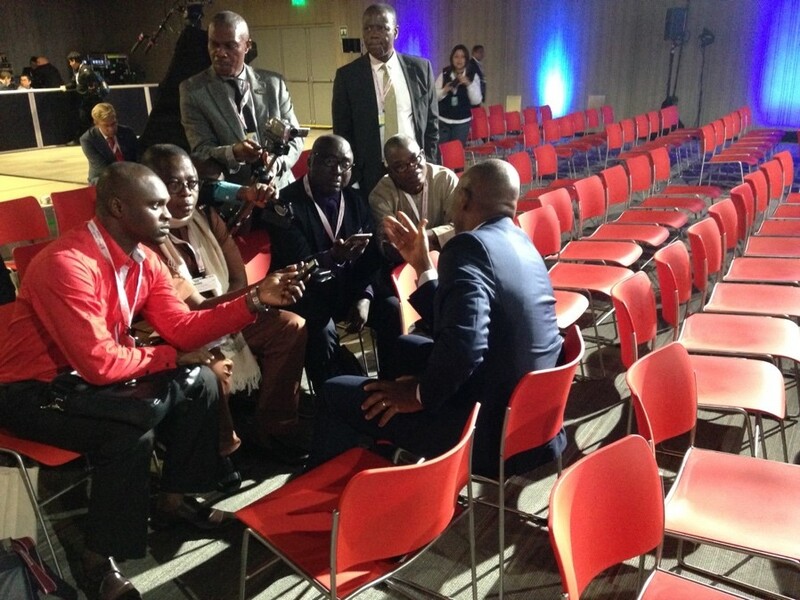 Meanwhile, there’s no break for our Chairman as media take advantage of the now empty hall to conduct interviews at the back of the room where he shed more insight into his remarks during the panel, emphasizing the importance of empowering the private sector to play a more explicit role in the achievement of the SDGs. 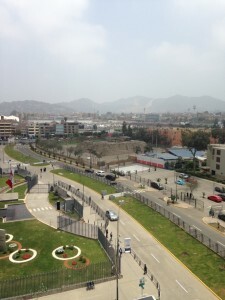 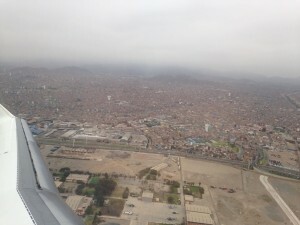 After a whirlwind few days, we take-off from Lima, headed for Lagos. We were blessed on the ride home for a breathtaking view of the Andes Mountains.